SARTELL — When Dr. Bea Winkler opened Pine Cone Pet Hospital in 2001, the staff consisted of herself, one veterinary technician, an office manager and a receptionist. Ten years later, the veterinary care facility is going strong with two doctors, four certified veterinary technicians, a receptionist and a part-time bookkeeper. Led by Winkler and Dr. Walker Brown, who joined the practice in April 2009, the practice serves pets from as far as Eden Prairie. 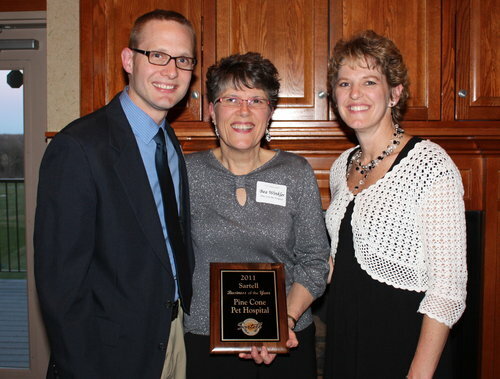 The pride in what they do for their patients and their community beamed through their smiles as they reflected this week about what it means to have been named Sartell’s 2011 Business of the Year. This was the second time the business has been nominated for the honor that is given annually by the Sartell Area Chamber of Commerce. The award was given April 28 during the chamber’s annual recognition banquet at Blackberry Ridge Golf Course and Event Center. Brown said they do not know who nominated the business but clients continue to express their congratulation. This impact is seen in Winkler’s helping challenged young readers to develop confidence by reading to dogs, and her serving as a Junior Achievement volunteer teaching financial responsibility to Sartell eighth-graders. Pine Cone Pet Hospital was recognized for its community involvement and efforts to recognize the value of pets in children’s learning, according to a the Sartell Area Chamber of Commerce. Next month marks Winkler’s 30th year as a veterinarian. To her, it doesn’t feel like it’s been that long. Brown, who has practiced for eight years, agrees that time can fly when doing what you love.